PORRO - Discorso intorno alla carta da navigare. PORRO, G. / MAGINI, G. - Discorso intorno alla carta da navigare. Discorso intorno alla carta da navigare. 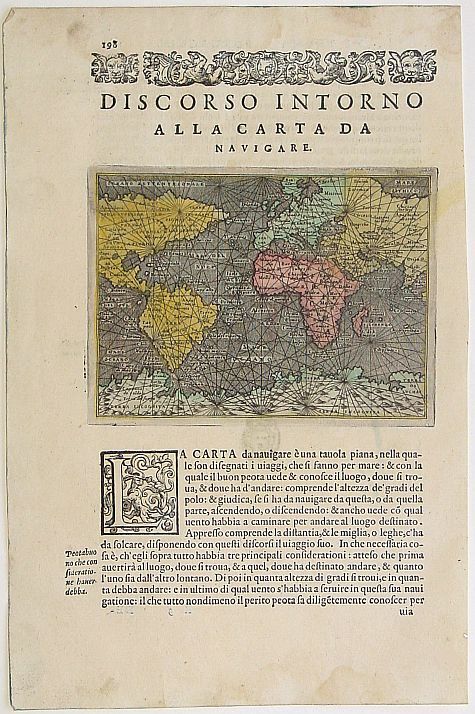 - PORRO, G. / MAGINI, G.
Title : Discorso intorno alla carta da navigare..
Map maker : PORRO, G. / MAGINI, G.. Size : 4.1 x 5.6 inches. / 10.4 x 14.3 cm. Description :An early edition of Porcacchi's mariner's map follows Gerard Mercator's large world map of 1569 on a much reduced scale. From "L'Isole piu Famose del Mondo" (The most famous islands of the world by Thomas Porcacchi (1530 - 1585) and engraved by Girolamo Porro. The first edition of this work was published in Venice in 1572. It covers most of the world, excluding Far Eastern Asia and the western coast of North America. The "Terra Incognita" landmass dominates the bottom of the map, which is criss-crossed with rhumb lines. On a full sheet of Latin text and including an extra leaf of text. Map shows navigation information and the text (in Italian) gives information about various travel routes as well as sailing winds. Condition : In very good condition. Letterpress with copper engraving.